Good morning everyone! The Peachy Keen "Let's Face it Friday" challenge this week is to incorporate leaves into our creations using Peachy Keen face stamps. I was so excited to use my brand new stamp set called PK-648 Faceless Scarecrow Dolls combined with the PK-649 Scarecrow Accessories stamp set (face and greeting). 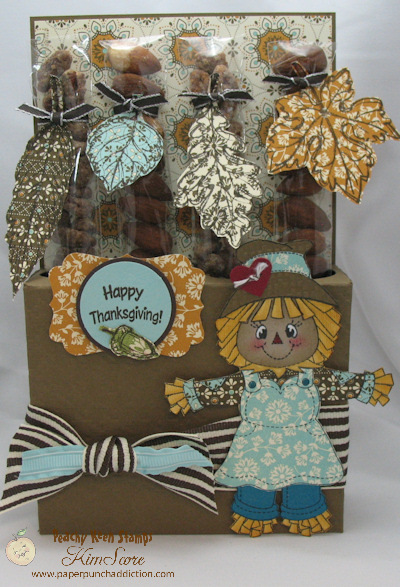 The leaves are from a Stampin' Up! set called Gently Falling. *All papers, inks and accessories by Stampin' Up! (1) Stamp scarecrow with black onto More Mustard card stock and cut out. Sponge edges with More Mustard ink pad. If you want to add more shading to straw, gently color a stroke along each straw with a More Mustard marker. Stamp just the head onto another piece of More Mustard and cut out just the straw laying on the face and sponge edges. (2) Stamp head with black onto Crumb Cake card stock. Stamp face from accessories set with black. Stipple rose onto cheeks. Color in nose with Cherry Cobbler marker. Add white hilights to eyes with uniball gel ink pen. Cut out face all the way to hat brim (don't cut around straw on face). Sponge edges with crumb cake ink. Glue face onto body. Glue straw "bangs" onto face. (3) Stamp head onto embossed piece of Soft Suede and cut out hat. Glue onto head. Stamp head onto spice cake dsp and cut out hat band and glue on. Punch small heart and glue onto hat. (4) Stamp lower part of body on Island Indigo card stock and cut out pants and glue onto body. (5) Stamp upper part of body onto spice cake dsp and cut out arms (leave the area across chest in once piece, cutting around straw around neck. Glue onto body. (6) Stamp body onto spice cake dsp and cut out dress and cuffs on sleeves. Glue onto body. Color in buttons with Island indigo marker. Create box following the instructions HERE (follow instructions for Four Tube variation) using Soft Suede card stock. Use the 1" punch for holes. For the backing, cut a piece of 4-1/2" x 7-1/2" soft suede. Layer 4-3/8" 4-3/8" spice cake dsp at top of piece (this is what will show above tube holder). Attach tube holder to backing. Wrap a length of espresso striped ribbon around box and tie a knot (slip a short length of pool party ribbon into the knot before tightening. Attach scarecrow with dimensionals. Stamp greeting with espresso ink onto pool party card stock. Punch out with 1-1/4" circle. Layer onto 1-3/8" early espresso circle. Layer that onto decorative label punch in spice cake dsp. Mount onto box with dimensionals. Stamp leaves from Gently Falling with early espresso ink onto spice cake dsp. Cut out leaves with stems. Fill bags with treats. I used almonds and praline pecans. Seal bags and then tie 1/8" espresso taffeta ribbon around top of each tube. Slip a leaf stem under each ribbon (you may want to secure with a mini glue dot).